A petty cash fund is a small amount of money, usually under $500, used to cover incidentals. Petty cash accounting involves establishing a petty cash policy, setting up a petty cash log, creating journal entries, and reconciling the petty cash account. Accounting can be done manually or made easier with bookkeeping software and employee expense cards. Managing petty cash manually can be time consuming and error prone. Instead, use QuickBooks Online to streamline your petty cash log, entries, and reconciliation. Get 30 days free, 50% off, and start managing your petty cash with the industry leading accounting software. 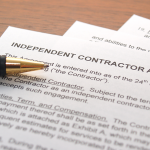 The first thing you need to do is document your petty cash procedures and communicate them to all employees. Assign one person to be in charge of petty cash, known as the petty cash custodian. This should be someone that you trust to adhere to the petty cash procedures. Determine the dollar amount you will keep in petty cash. In general, a small office might only need a couple hundred dollars; however, a larger office might need as much as $500. Inform employees that a receipt is required for all petty cash purchases of $75 or more; a receipt scanner app can help minimize the chance of lost receipts. The petty cash account should be reconciled on a monthly basis or each time it is replenished (whichever comes first). Petty cash purchases should be recorded on the books on a monthly basis if not more often. While establishing a petty cash policy won’t eliminate common issues that may arise like theft, abuse of funds or lost receipts, it will help to minimize some of these issues. To further reduce these issues, many business owners are moving away from cash and instead using prepaid business cards. Check out our How to Do Petty Cash Accounting with Business Credit Cards section for more details. A petty cash log is a detailed account of all deposits and withdrawals made from the petty cash account, including the date of purchase, a brief description of what was purchased, the account it should be charged to, who received the funds and who approved it. In general, you should keep one petty cash log template per month. Petty cash transactions should be recorded at least once a month, if not more often. Whether you use an accounting software like QuickBooks or an Excel spreadsheet to keep track of your income and expenses, these purchases are recorded as a debit (increase) to an expense account and a credit (decrease) to the petty cash account. 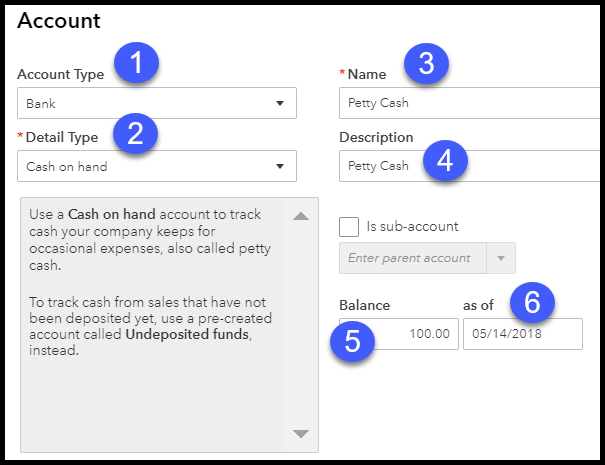 In the How to Set Up Petty Cash in QuickBooks section, we show you how QuickBooks records these purchases behind the scenes. If you use Excel, head over to the How to Track Petty Cash with an Excel Spreadsheet to see how this works. Reconciling petty cash entails making sure you have a receipt for every petty cash purchase in your petty cash log and creating a journal entry to record it on the books. While I firmly believe you should require a receipt for all transactions (regardless of amount), the IRS only requires a receipt for purchases that are $75 or more. 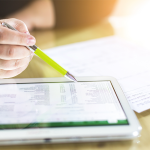 Now that we have covered the key steps of petty cash accounting, we’ll take a closer look at the three primary ways to record petty cash: with accounting software like QuickBooks, with a spreadsheet like Excel, and importing from credit card statements. Managing petty cash in QuickBooks involves three steps. First, you need to set up a petty cash account to keep track of all petty cash transactions; second, record all petty cash disbursements; and third, replenish the petty cash account when it has been depleted. A petty cash account is set up like a bank account in QuickBooks. To set up a petty cash account, you need to navigate to add a new account to the Chart of Accounts. From the main dashboard, select Chart of Accounts and then click the New button. The following window will display. Account Type – From the dropdown, select Bank as the account type for a petty cash account. Detail Type – Select Cash on Hand in this field, which is how petty cash accounts are categorized in QuickBooks. Name – In this field, you can indicate Petty Cash as the name of the account. Description – In this field, you can simply copy and paste the name of the account or you could indicate what this account is used for (e.g., office supplies, postage expense). Balance – Enter the amount that you would like to start the petty cash fund with in this field. As of Date – Enter the date that you established the petty cash fund. This field will generally default to today’s date. For step-by-step instructions on how to add a new account to the Chart of Accounts, watch our How to Set Up the Chart of Accounts video tutorial. Date – Enter the date of purchase in this field. Payee – Select the payee from the dropdown menu. If the payee does not exist, you can easily add them in this screen by selecting Add new. Check out our How to Set Up Vendors video tutorial for step-by-step instructions on how to add a new vendor in QuickBooks. Expense Category – Select the appropriate expense category from the dropdown (e.g., office supplies, postage). Memo – Enter a brief description of the items purchased in this field. Payment – Enter the amount paid in this field. Once you save this transaction, QuickBooks will record a debit (increase) to the expense account you selected in the expense category field and a credit (decrease) to the petty cash account. This transaction will increase your expenses on your profit and loss statement and decrease your assets on the balance sheet report. Transfer Funds From – From the dropdown, select the account that you are withdrawing the funds from; generally, this will be your business checking account. Transfer Funds To – From the dropdown menu, select the Petty Cash account. Transfer Amount – Enter the amount you want to replenish the fund with. Memo – Enter a description in this field. Date – Select the date you are replenishing the petty cash fund. Once this transaction is saved, QuickBooks will record a debit (increase) to the Petty Cash Fund and a credit (decrease) to the Business Checking account. Since this transaction involves two asset accounts, the balance sheet will be the only financial report affected. Check out our complete QuickBooks course to learn how to use QuickBooks to manage your income and expenses. Keeping track of petty cash using an Excel spreadsheet will consist of two primary steps: keeping a detailed log of the deposits and withdrawals made to the petty cash fund and recording a journal entry at least once a month to record these transactions on your books. Download your free petty cash log template. In order for you to have accurate financial records, you need to record your petty cash transactions on a monthly basis, if not more often. You will need to record a journal entry for deposits made to the petty cash fund and a journal entry for withdrawals made from the petty cash fund. As discussed in the previous section, you generally withdraw money from your business checking account to fund petty cash. The journal entry that needs to be recorded is a debit (increase) to the petty cash fund and a credit (decrease) to the business checking account. Withdrawals made to the petty cash fund will be recorded as expenses. The journal entry that needs to be recorded is a debit (increase) to the appropriate expense accounts and a credit (decrease) to petty cash. If you’re ready to upgrade from a petty cash box and manually tracking petty cash purchases with petty cash logs and Excel spreadsheets, business credit cards are a great alternative. There are prepaid business credit cards that allow you to determine your spending limits based on the amount you load on the card. In addition, you can apply for a small business credit card and your credit limit will be determined by your business credit score. Using prepaid business credit cards is a lot less risky and much more automated process than using petty cash. In addition to not having cash sitting in a box that you have to worry about someone stealing, you can easily control what types of expenses the cards are used for by assigning them to individuals, departments or even for certain events like a company picnic. The limit on the card is based on the amount that you load on the card. Details of each purchase (amount, date, payee) will be available for you to access and download to an Excel spreadsheet or your accounting software. Eliminates the need to use petty cash vouchers and logs. One-click spending turn on/off mechanism. Bento is our recommended best business prepaid card. It offers all of the features above and much more. Check out our Best Business Prepaid Cards Guide for more details. Similar to prepaid business credit cards, unsecured business credit cards also offer similar benefits: no need to keep track of petty cash logs and vouchers and no risk of theft of cash, but you will have to outline what types of purchases are acceptable and which are not as part of your corporate credit card policy. The limit on the card is based on your business credit score and payment history. All of the information you need (e.g., amount, date, payee) is available on your business credit card statement, which you can download to Excel or your accounting software. No more petty cash vouchers or logs to worry about. Create alerts to notify you when a single purchase is over a certain dollar amount (e.g., $100). Check out our Best Small Business Credit Card guide to find a card that’s right for you and your business. Recording purchases made with business credit cards is easy. If you use an accounting software like QuickBooks, you can easily connect your business credit card account to the software and download all of your petty cash purchases with just a few clicks! If you use Excel, you can easily download your purchases to an Excel spreadsheet and the follow the instructions in Step 2 of the How to Record Petty Cash in Excel section. If you plan to continue to use cash for small business purchases like postage and office supplies, then you should use QuickBooks. QuickBooks makes it easy to keep track of all deposits and withdrawals to petty cash. In addition, your financial statements are automatically updated once you save a transaction.